With the arrival of the new school year, Eco-Schools USA introduced two new environmental focus areas, or pathways of sustainability. The first new pathway is the WOW pathway or Watersheds, Oceans and Wetlands. To celebrate the new pathways and to test drive the WOW pathway resources and audits, NWF’s Eco-Schools staff spent several days at Smith Island in the Chesapeake Bay in Maryland. Staff paddled in canoes to a nearby marsh, identified plants and wildlife, collected data such as soil and water samples and then spent time speaking with island residents about the impacts of climate change on their lives and on the island. Staff created Action Plans and determined the best avenues for integration of the WOW pathway into school curriculum and community. This hands-on testing allows Eco-Schools USA staff to put themselves in the place of educators and students and to ensure that the resources and programming they are developing work in the field and classroom and support student learning. NWF is planning to continue to “test drive” all new audits as they move forward in the development of new pathways and revisions to existing ones. NWF’s second new pathway, Learning about Forests (LEAF) is a Foundation for Environmental Education (FEE) programme hosted by NWF in the United States. NWF has chosen to start the implementation of the LEAF programme as a pathway under the Eco-Schools USA programme. This brings the total number of pathways in the United States to twelve, and provides schools with opportunities to integrate a wide range of authentic, place-based, and environment focused instructional strategies as part of the school’s curriculum. The LEAF pathway builds upon NWF’s Schoolyard Habitats™ programme and Trees for Wildlife programme. Students will utilise the forested landscape as a classroom for learning, and have the opportunity to increase their knowledge about the key role forests play in sustaining life on our planet. Schools will take actions such as creating “Tiny Forests” or “Food Forests” on their school grounds or in their communities, or investigate the concept of forest fragmentation on bird species and plant trees in urban areas to decrease the impacts of climate change. n the U.S. not all schools are located near water, but with water being a critical environmental issue, learning to be good stewards of our waterways is crucial. Schools can choose to address any of the three pathways: Watersheds, Oceans or Wetlands to learn how to better conserve and protect these precious natural resources. Some of the ways in which schools are addressing these issues include developing a campaign around plastic waste in oceans, learning about their local watersheds or field investigations on the impact of runoff on wetlands and wildlife. 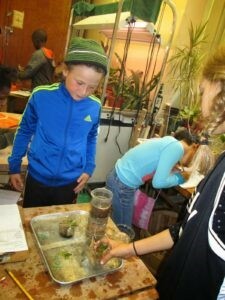 Older PostFood: New Theme in Eco-Schools!